Welcome points to the infinitely important invitation to be comfortable, be yourself. To be welcome is to be home. At the heart of the Wesley Foundation at Oklahoma State University in Stillwater is an understanding that students from all walks of life are welcome to a place beside campus to call home and to embrace a radical welcome that will leave them changed. As the Wesley prepares to officially break ground Oct. 8 on a grand new facility, including student housing on its third floor, former students recalled the personal impact of that welcome — as long ago as the 1960s. That’s when Gary Sparks lived in the Wesley basement. Today he’s the architect for the new building. Sam Powers, now senior pastor of Edmond-First UMC, lived in the basement during his junior and senior years at OSU in the late ’80s, and served as a live-in custodian for the United Methodist campus ministry. During that time, he was also a paid student intern. Rev. Powers first got involved by happenstance. He saw an ad in OSU’s student newspaper for free Sunday night meals, and through those meals served by the Wesley he reconnected with peers he’d met at United Methodist youth camps. "I definitely grew as a leader at the Wesley," Powers said. "Leading prayer groups, Bible studies, Sunday school classes, planning trips — these were all a part of my experience. "At some point, I met a seminary representative, and we had a conversation about God’s call in my life and whether or not I was being called into ordained ministry. My activity at the Wesley made this call apparent to me. I wouldn’t say God wouldn’t have called me if I hadn’t been active at the Wesley, but I do know that I am a much better pastor today for my time there." Recent OSU graduate Aubrey Ewing remembers going to the Wesley during OSU’s Welcome Week in her freshman year. She was hooked. She volunteered a lot, attending mission trips and helping out with services such as Exposed, a monthly worship service for women. "The Wesley changed me in so many ways it’s hard to put into words," Ewing said. "The building itself was a home right next to campus. I used the Wesley as my home. I feel like I might have not been able to function properly in college without it. "At the Wesley, you were challenged intellectually and philosophically. It’s a really good place to be out of your comfort zone. I met all sorts of people from different backgrounds, and I wouldn’t have met them if I’d stayed in my college bubble. I’ve been forced to think of things from a lot of different perspectives because of the Wesley." 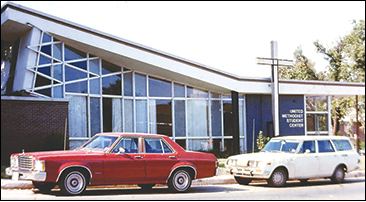 Sparks’ history with the Wesley began in about 1963. He was beginning his third year at OSU. Despite working a construction job over the summer, he realized that he didn’t have enough money for housing. Sparks figured he’d continue with school as long as he could but eventually would have to drop out. Through a friend, he found out about the Wesley basement, a potential living situation, and with the staff’s OK he lived there that school year in exchange for working as a maintenance man of sorts for the ministry. "I’ve always felt indebted to the Wesley because they helped me continue my education," Sparks said. "I have a strong desire to make this really special," he said of the design for the new facility. "I want people to see what’s going on and want to be a part of it." Sparks, a member of Tulsa-First UMC, also was the principal architect for the renovations of OSU’s Gallagher-Iba Arena and Boone Pickens Stadium. "Regardless of who you are, you’re welcome" at the Wesley, said Michael Bartley, the ministry’s executive director. The Wesley caters to undergraduate and graduate students, as well as their families. Some participants are United Methodists; others are Southern Baptist, Catholic, nonreligious... You fill in the blank. While the ministry has grown eminently over the decades in student participation, programming, etc., the aging facility was falling apart, didn’t do much for its mission, and didn’t appeal to wider audiences. Something had to be done. The Imagine Campaign was launched. It will build a new three-story facility at 823 W. University, replacing the former building on the original site. During construction, the Wesley is meeting at 521 W. University. Phase 1 of the capital campaign is complete and consists of $6.5 million in pledges. Phase 2, to create residential space on the third floor, is still in the works, with a goal of $3 million by December. To learn more about the Imagine Campaign, contact Rev. Bartley at 405-880-7194. "My path toward spiritual development is continually unfolding, but the Wesley Foundation first dared me to imagine what it might look like," said former student Kathryn Peters. In part, testimonials like these are responsible for making the Wesley what it is today, as well as how it will be in the future. Vehicles parked at the OSU Wesley in Stillwater help date this archival photo from more than 40 years ago.